Earth’s Green Heart, a series of educational visual resources, a tool in the ongoing need to conserve our planet’s fragile biodiverse equatorial rainforests. 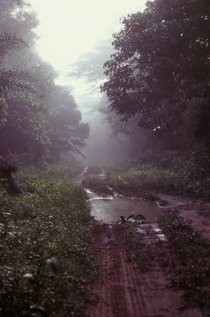 The Congos, lands that conjure up fear, awe and adventure. These are the two nations that form the very heart of this vast and ancient continent, yet few venture into the depths of Africa’s truly last great frontier wilderness!. I chose to come to the Congos in search of the vast Equatorial forests that represent our planet’s second green lung and the earth’s richest and the most diverse biodiversity to be found any where on our planet. My introduction to the Congo’s was by way of Maya Maya in Brazzaville perhaps one of the most chaotic international airports I have so far visited. As I stood and sweated profusely wondering if indeed I may ever collect my luggage a Congolese explained in a comforting tone “don’t worry, things will be fine once you leave the airport for town.” After having paid 7000 CFA I finally boarded a clapped out taxi into town wondering what could possibly lie ahead. Like the Gabon and many other Francophone nations in Africa, Brazzaville is expensive with the cost of daily life outstripping even my weekly simple routine in London. After a couple of days in Brazza, I chose to head north in the direction of the vast Equatorial rainforests that begin on the Atlantic shores of Gabon and continue on across the heart of this vast continent and on into the great lakes region of eastern RDC. 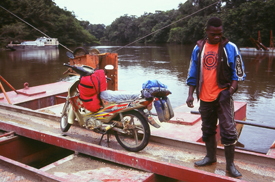 Makoua lies virtually right on the Equator and from here I was to hire a motor cycle to begin a three day journey in the direction of Obomo, the administrative centre for one of Africa’s least known but undoubtedly most spectacular parks. The logistics of attempting to visit Odzalla during the height of the Congo’s rainy season was to say the least either bad planning or simply reckless. Odzalla is not connected by road and what is referred to as a road is in reality no more than a dirt track which in the rainy season often appears to be either a fast flowing river or a trench gauged out of the forest rich red lattérite soils. Whilst in Makoua I was to lodge with the Franciscans who ran a small monastery in the town and I was not only very much welcome but found the monastic environment appealing in its lack of materialistic brashness. After negotiating with a local taxi motor I finally left the relative comfort of the Franciscans for the open dirt tracks and drove in a westerly direction. And within an hour of being on the road the heavens were to open(ed) and released a continuous torrent of Equatorial rain which in turn created an even more treacherous road on which to travel. epicentre of a large outbreak of Ebola and even today a notice board outside the village warns visitors of the risk of this very little known but deadly virus which periodically mysteriously still occurs across the region with a devastating impact. 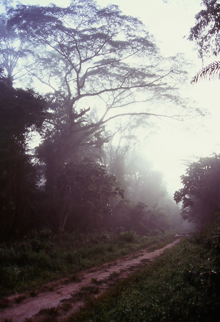 After the village of Etoumbi I was to travel along rain sodden tracks in the direction of Mbomo which although not far seemed like a journey without ending. 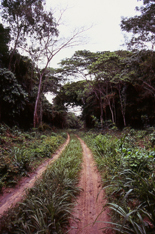 The tracks were not only waterlogged but the surrounding vegetation in places had virtually grown over what had once been a road and as the motor taxi traversed I had to constantly guard my face from the overhanging foliage. At the last village before Mbomo the track became virtually impassable and we were forced to rest for the night as another Equatorial rain storm inundated the village with thunder, lighting and a constant torrent of torrential rain. 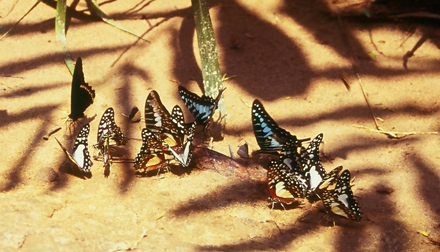 The following morning the early tropical sunlight shone bright and clear and the previous night’s menacing storm had passed as if a distant fleeting dream, for the new dawn was alive with the sight and sounds of birdsong, butterflies and a variety of colourful flying insects. Although the track was still difficult in places with pools of rainwater and thick encroaching vegetation we were to finally reach Mbomo by midday. The village appeared picturesque set amongst green hills covered with thick Equatorial forests. After having arranged to stay in the Catholic mission I then paid a visit to the park’s offices to enquire what formalities I would be expected to follow before being allowed into the park to view the wildlife. remote northern region of the Congo Brazza. I was too be accompanied by a cook and two local guides to an encampment which lay a kilometre from the protected camouflage viewing point looking into the swamp clearing that formed the Saline. The waters of the Saline are rich in natural salts and minerals which in turn attract a vast microcosm of insects birds, butterflies and other mammals such as Elephants, buffalos, antelopes and other species, but the Western Lowland Gorillas were my primary interest. On arrival we were to pitch tents and then myself and a guide headed into the forest to the camouflage viewing point and no sooner had I begun to view the Saline, a group of up to 10 Gorillas appeared and cautiously approached the swamp waters of the Saline. I was never too sure if in fact the gorillas were aware of my presence or not, for these majestic cousins of mankind were always cautious and vigilant in the extreme. On our return to the camp I became irritated by the constant loud chattering of the cook Madam Kombo who also had the unpleasant habit of snoring loudly until the early hours of the dawn. On the second day I was fortunate.. The full journal is included in the new book which will soon be for sale online and in select book stores.